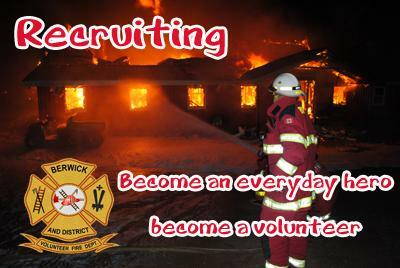 The Berwick & District Volunteer fire Department is a totally volunteer force of approximately 50 members. Our coverage area spans from the Bay of Fundy on the North, to the top of the south mountain and includes the Town of Berwick. We respond to an average of 100 – 125 calls per year. These calls include structure fires, motor vehicle crashes, medical assistance calls, brush fires, and various other emergencies. Training is a major component of the activities of the Fire Department. The members are trained professional fire fighters, and the department operates using the NFPA (National Fire Protection Agency) Standards as a guideline. The Berwick & District Volunteer fire Department operates on a budget that is a partnership between the Town of Berwick, The Fire Commission for the District of Berwick, and the Fire Department members. The new fire hall was a 50-50 split between the town and the commission for the main construction costs. The members are contributing to the new hall with materials and labor in the construction of the cold storage building, the on-site training facilities, and various projects to complete the facilities. The membership raises their portion of funds through a number of fund-raising activities. These include an annual Christmas raffle featuring prizes donated by local businesses and individuals, a bi-annual Club 400 draw, and various dances and car-washes throughout the year. The membership also raises funds through the rental of our recreation hall and classroom. Interested in joining the team? Application forms can be found here.